Before my daughter was born I decided to make my own baby food. Several friends had done so and raved about the cost savings, ease and enjoyment. That, coupled with my plans being justified after reading My Two-Year-Old Eats Octopus, inspired me to put a new blender and food processor on my registry. The gift was fulfilled and last month I put it to use for the first time, as my now five-month-old daughter was ready for solids. Solids in the form of pureed, liquified vegetables. I’m certainly not on a high horse about it, as I’ve unfortunately been accused. Instead, I’m sharing my experience with it because I’m shocked at how easy, affordable and fun it is. Plus, it’s a really healthy option to feed my daughter and expose her as young as possible to fresh foods (and my love of cooking!). 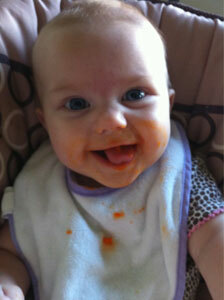 Processed, jarred baby foods can mask the true flavor, smell and color of fruits and vegetables. Plus, the pre-made baby foods at the store come in a limited variety and cost, in some cases, more than a dollar a jar (or, a dollar per feeding). I haven’t found zucchini or pumpkin at the store, but my daughter has enjoyed both of those varieties at home. When I was growing up, one of the many mantras in our house was “This is not a restaurant, you’ll eat what I fix for dinner or go to bed hungry.” That meant from the time I went off the bottle until I moved to college I ate what was served for dinner. I had meatloaf, tuna casserole, spaghetti, hamburgers, or anything else my mom decided to fix that night, like it or not. We never had any kid food, you know, the food that is served to the kids but not the adults. Grilled cheese, hot dogs and chicken nuggets are staples in the American child’s diet, while mom and dad prepare something more age appropriate for themselves. Although, when did food become age appropriate? 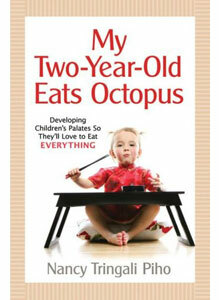 That’s exactly what author Nancy Tringali Piho is asking and arguing in her newly released book My Two-Year-Old Eats Octopus: Raising Children who Love to Eat Everything.